Alzheimer's disease specialists applauded the US Food and Drug Administration action warning companies to cease making false marketing claims about the efficacy of dietary supplements for dementia. For neurologists whose patients ask about dietary supplements to prevent memory loss, the U.S. Food and Drug Administration (FDA) warning to companies promoting these products couldn't come soon enough. The action by the federal agency underscores a message they often provide their patients, several clinicians told Neurology Today. “I am often approached by patients and their families when they start having memory loss, as well as by people who are worried and interested in decreasing their risk of Alzheimer's,” said Douglas Galasko, MD, professor of neurology at the University of California, San Diego. The lack and evidence and shaky promotional claims were the cause for the February 11 announcement from the FDA. The agency had sent 12 official warning letters and five online advisory letters to companies selling more than 58 supplements, many of which were marketed online or on social media. In its statement, the FDA stressed that the products have not been proven safe and/or effective and could potentially prevent a person from seeking medical help. Many of the cited products also make claims for being beneficial for patients with other diseases, including Parkinson's and Huntington disease, vascular dementia, and recovery from brain injury. The crackdown is part of a larger effort aimed at overseeing and regulating the supplement industry that has witnessed explosive growth in recent decades, former FDA Commissioner Scott Gottlieb, MD, said in a statement accompanying the announcement. “What was once a $4 billion industry comprised of about 4,000 unique products, it is now an industry worth more than $40 billion, with more than 50,000—and possibly as many as 80,000 or even more—different products available to consumers,” noted Dr. Gottlieb, who announced on March 5 that he was stepping down in April as commissioner. The FDA told the supplement manufacturers that their products violate the Federal Food, Drug, and Cosmetic Act. Companies were ordered to respond within 15 days of receiving letters and explain how the violations will be corrected. Failing to promptly correct the violations could result in legal action, product seizure, and/or an injunction, the agency said. The FDA has sent more than 40 warning letters over the last five years to companies illegally marketing over 80 products in violation of the Federal Food, Drug, and Cosmetic Act. But the FDA noted they continue to make unproven claims for many unsafe and unapproved products, which are sold “due in part to the ease with which companies can move their marketing operations to new websites,” the agency said. The warnings came as part of broader FDA initiative to provide a flexible regulatory framework to uphold safety and integrity of supplements, including quickly alerting the public about products that may contain unlawful or potentially dangerous ingredients. Dr. Galasko told Neurology Today he believes the FDA's efforts will prove helpful in reinforcing his messaging to patients. He added, too, that statements about the false claims from professional bodies such as the AAN, American Geriatric Society, and organizations about the Alzheimer's disease association discussed in these studies would be helpful. Neurologists also can more actively educate their patients about the false claims, said Oscar L. Lopez, MD, FAAN, professor and director of the Alzheimer's Disease Research Center at the University of Pittsburgh. Dr. Lopez said he advises families that there are no published studies showing any benefits, and often refers families to the Alzheimer's Association website. “Even so, not much more can be done,” he told Neurology Today. Joshua W. Miller, PhD, professor and chair of the department of nutritional sciences at Rutgers, the State University of New Jersey, said he and his colleagues have conducted several epidemiological studies looking at associations and relationships between specific nutrients in supplements and cognitive function, cognitive decline, and risk of AD and dementia in older adults. “There obviously are diseases caused by vitamin, mineral, and essential amino acid deficiencies, but supplements for these are not ‘drugs’ because deficiency diseases are well established. However, when claims are made about dietary supplements curing, mitigating, treating, or preventing diseases, they are no longer considered dietary supplements, but drugs by the FDA,” he explained. Patients and the family members have often spent large amounts of money buying these and similar supplements lacking any solid clinical evidence of improving their symptoms, added Jonathan Graff-Radford, MD, FAAN, a co-investigator at the Mayo Clinic Alzheimer's Disease Research Center, in Rochester, MN, who studies mild cognitive impairment, vascular cognitive impairment, Alzheimer's disease, Lewy body dementia, and other neurological disorders. “It is important that clinicians who see patients with cognitive concerns take the time to educate them regarding these supplements and understand the motivation behind the request rather than dismissing the patient's questions without discussion,” he told Neurology Today. For example, he said, a seminal randomized, placebo-controlled trial published in 2008 in the Journal of the American Medical Association by neurologist Steven T. DeKosky, MD, FAAN, and colleagues showed twice-daily doses of 120-mg extract of gingko biloba did not reduce the overall incidence rate of dementia among elderly individuals compared with a placebo. Dr. Graff-Radford said he discusses with his patients the healthy behaviors they can engage in that have potential cognitive benefits, including performing cardiovascular exercise, eating a healthy diet, and staying cognitively active. Dr. Galasko has received consultant fees from vTV Pharmaceuticals, LLC, for service on its advisory board, as well as fees for service on the data safety monitoring committee for Cognition Therapeutics, and for his service as editor-in-chief of Alzheimer's Research & Therapy. Dr. Graff-Radford receives an honorarium from the AAN for speaking and writing for Continuum. •. DeKosky ST, Williamson JD, Fitzpatrick AL, et al Ginkgo biloba for prevention of dementia: A randomized controlled trial https://jamanetwork.com/journals/jama/fullarticle/182920. JAMA 2008;300(19):2253–2262. 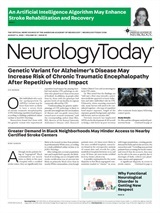 Neurology Today19(7):1,11-12, April 4, 2019.